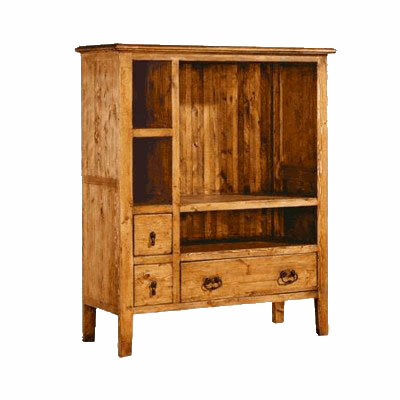 This is a lovely entertainment center, with an almost a retro-Zen appeal. The 4 legs set this piece apart and help you create a unique environment in your Mexican living room. It has space to accommodate a large TV, features a DVD shelf as well as smaller shelves for books or artifacts. Two additional square drawers are reminiscent of Asian apothecary cabinets. A larger, rectangular drawer helps you store smaller items such as remote controls or CDs so that they can be out of sight yet readily available. Choose your favorite stain to match your preference and your Mexico home's decor.